Austin, prepare to be served. Spin, the long-awaited bar devoted to all things table tennis, will finally officially open its doors on May 18 at 213 W. Fifth St., the space once occupied by one of the former iterations of Antone’s. The nightlife chain was founded in 2007 after a series of Friday night pingpong parties thrown by entrepreneurs Franck Raharinosy and Jonathan Bricklin became one of New York’s hottest tickets. In 2009, Andrew Gordon joined the team to launch the bar, which quickly expanded across New York, Chicago, San Francisco, Seattle, and Toronto. And yes, this is the same table tennis concept that Academy Award winner Susan Sarandon co-founded, although she is no longer involved in the day to day. 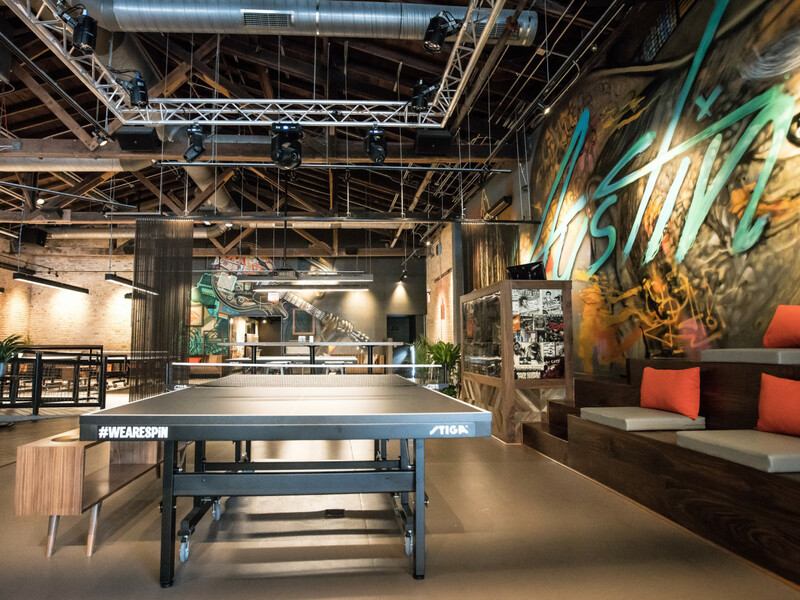 The large Austin location will feature room for 500 guests and 14 regulation pingpong tables, ensuring that no one will have to wait long for their turn. Players can compete against teams from other cities via virtual reality and an app that keeps track of all the rankings. Less athletic guests can enjoy the private lounge or the “three seasons” patio, which is perfect because Austin only has three seasons anyway. The interior spaces keep the building’s storied history in mind, and the design team revived many of its original elements. The wood ceiling beams were worked into the interior, and reclaimed barn wood and exposed brick were brought in as an homage to its former occupants. Local artists Boza, Jason Eatherly, and Happy Robots were drafted to paint pingpong-themed murals. Although Spin has not published the food and bar menu yet, it did tease that it will offer Austin-inspired dishes like pork jack tacos made with reposado onions and escabeche and drinks like the Pablo-Bee-Casso using Wood Creek Distillery Gin, jalapeño, Round Rock Honey, star anise, and lemon. Currently, the bar is open with limited hours as part of the soft opening phase with kids welcome during the day. Full hours will be introduced after the May 18 can't-miss grand opening party with a special appearance by Austin's own Gary Clark Jr.